Teacher Bridget O’Malley’s students put on a stunning performance of The Lorax and raked in nearly $900 for the North Jubilee Wetland Reclamation Project. 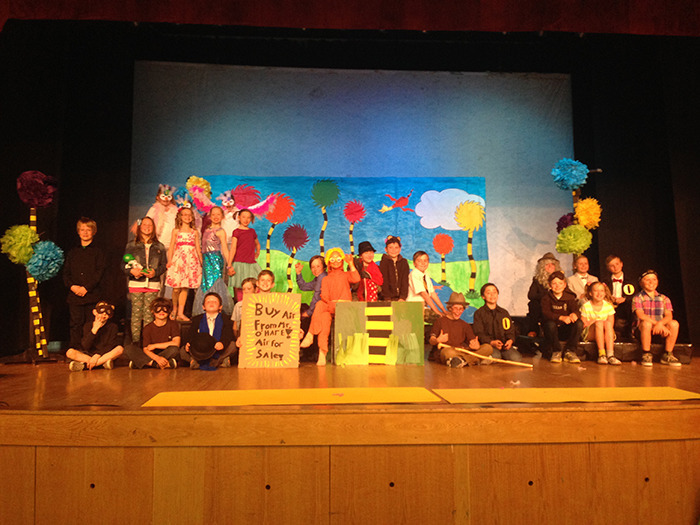 Earlier this year, in March, Rossland Summit School (RSS) teacher, Bridget O’Malley and her grade 4/5 class put on a fundraiser performance of the classic Dr. Seuss tale, the Lorax. The performance was to raise money for the North Jubilee Wetland Reclamation Project and altogether the students raised $878. With the theme of the book being about stewardship and caring for the environment, O’Malley wanted the community project to reflect this message. The wetland project will convert the field area that has been drained and treated as a regular park for over 60 years into something everyone can use more effectively, especially the critters that call these environments home. “During the wet months — like the Spring and the Fall — the area is naturally saturated so it already draws a number of species of birds and frogs to the area,” said Rossland resident and project handler Racheal Roussin. Neither party had anticipated raising as much funding as they did with the Lorax play. The project should involve digging out three shallow wetland pools around knee high and 20 meters across. In addition to adding pathways and public access points, the wetland creation will allow surrounding areas to maintain their levels of dryness, thus reducing the maintenance workload on the city. “This project will create a safer more natural environment for the animals that live there,” Roussin said. The ground is quite wet most of the year with pools of water standing at about an inch or two in depth. Due to the land being saturated for a large portion of the year, the city is not able to mow the grass which detracts from the overall look. Current drainage systems are not equipped to deal with this and so instead of trying to remedy this situation, the wetland project makes things easier by going with the flow. Not only will the project have great impacts on the ecology of the area, but Roussin said the schools are very excited to see this initiative be completed as the wetlands present a great opportunity for educational opportunities. The students will then have access to a nearby outdoor classroom which they can attend regularly. “We have plans to construct the wetland ponds during the dryest season, which is typically the end of September, so our fingers are crossed,” Roussin continued. Additionally, a walk-over bridge is planned for the ponds but some hiccups have prevented any solid plans from forming. During that time we’re going to be engaging with all members of the community and school groups for anyone who wants to come out and get their hands in the soil. Overall, Roussin said they are looking at planting close to 2000 grasses and 800 shrubs.